the price is not inluding dust collecter. but grinder with 2 pcs grinding stones. 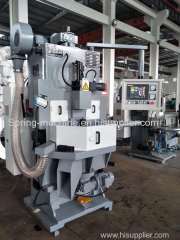 The grinding machine uses 2 upright grinding wheels, the springs are set on the feeding plate. Feeding speed of the upper grinding wheel is adjustable, in continuous and stepping feeding, allows the spring reach a preset height, obtain a maxi grinding capacity according to the pressure used. This machine has the function of self-compensation, self reset, alarm. Using man-machine interaction, we can make programming via the screen which makes it easy to use and increase the productivity. To "fully satisfy our customers" is our main principle since the foundation of the company and it will continue to be our principal motto for the next century.